No matter where you live, pots of flowers and plants add pizzazz to the ordinary, brighten dull areas with splashes of color and transform blank spaces into focal points. Though it really is one of the easiest landscape projects, there's more to creating a gorgeous container garden than putting out some pots. Here are some simple and easy ways to get spectacular arrangements. Color: This is perhaps the most important aspect. Cool tones, such as green and blue, recede, making a space look larger. Warm colors, such as red and orange, stand out, and help create a closer, more intimate atmosphere. To enhance overall harmony and continuity, plant the same or softly complementary floral and foliage tones in your planters and group them together. However, if you want to emphasis the individuality of each garden container, use different plant species and colors in separate pots to achieve that result. Texture: This can be as important as color. The details can be large or small but without them, the visual harmony it makes will be diminished. A textured plant has a big impact on our senses. Match plants that have similar textures. Use garden plants that are similar. Concrete, terracotta baked clay, poly resin or high shine glazed will all give a different look and feel to the arrangements. Employ texture to evoke different moods and effects and don't forget to keep the look, feel and touch of the container as well. 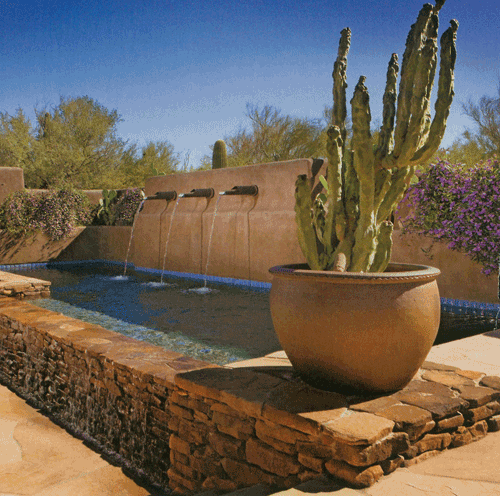 Choose a finish that accents and improves the plants texture. Form: Shape and structure are powerful design tools with which you can produce a wide range of emotions, such as drama or tranquility. This applies to both containers and plants. Sharp lines and angles tend to create excitement. If you prefer a calm relaxed atmosphere, try curved lines and rounded forms. Pot shape is very important. Using the same form though out could become monotonous, but on the other hands, a collection of many different ones is likely to look jumbled. Scale: This involves proportion and size. Working with just these two aspects alone can produce very different container designs. 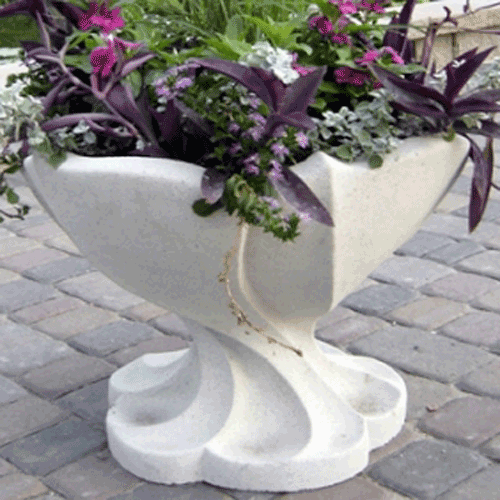 Try to incorporate two or three different pot sizes and shapes in a collection. Visual interest results from the noticeable difference between pots. 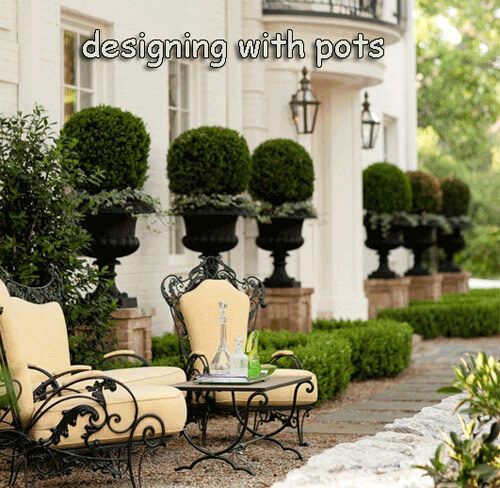 Choosing plants that accentuate the look and shape of the pots further enhances the display. 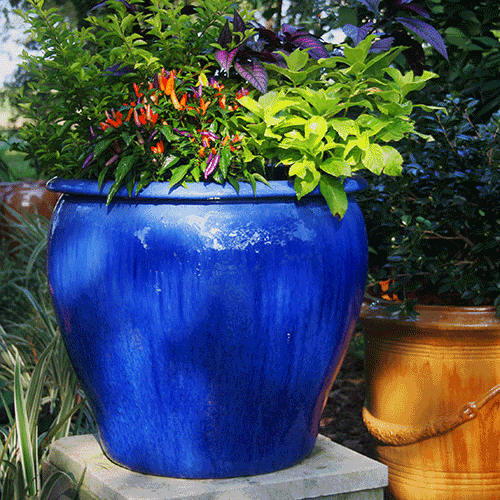 Try a tall and narrow pot or a short and wide container and choose plants that accent them. Read more.....A gardeners Play Station. Read more.....A room for all seasons.